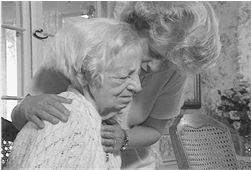 Characteristics and intervention techniques associated with the later stages of dementia disorders are defined and demonstrated with actual older adults experiencing severe confusion. Seeing these touching examples of gentle understanding will give new insight to those viewing this video. An extensive program guide accompanies the video. If the complete series is purchased, the price is $693.00, a cost of $99.00 per tape.